Allegro 121 Upright Piano in Ebony. 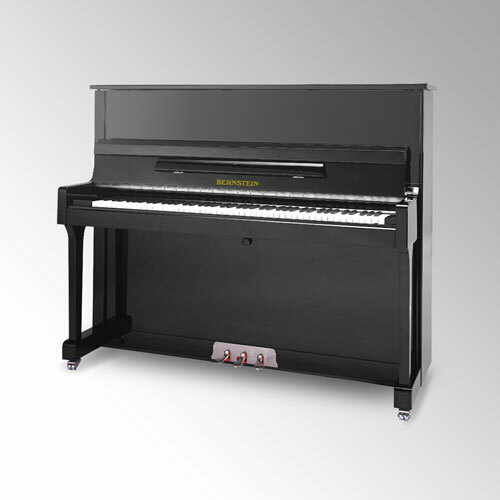 “The Bernstein 121 Allegro is the type of piano that you can sit down and play and enjoy all styles of music on. The smoothness of touch, the beautiful contemporary sound and everything about this piano just flows. It is comfortable to play whether you have a light or hard touch. Enjoy the wonderful tone which has clarity in any room it is placed in. It’s a feeling you will want to experience again”. This 121cm model offers greater string length and soundboard area for improved dynamic response and power. It’s cabinet offers timeless elegance and colour choices include Polished Ebony, Polished Ivory, Polished Mahogany and Polished Walnut.